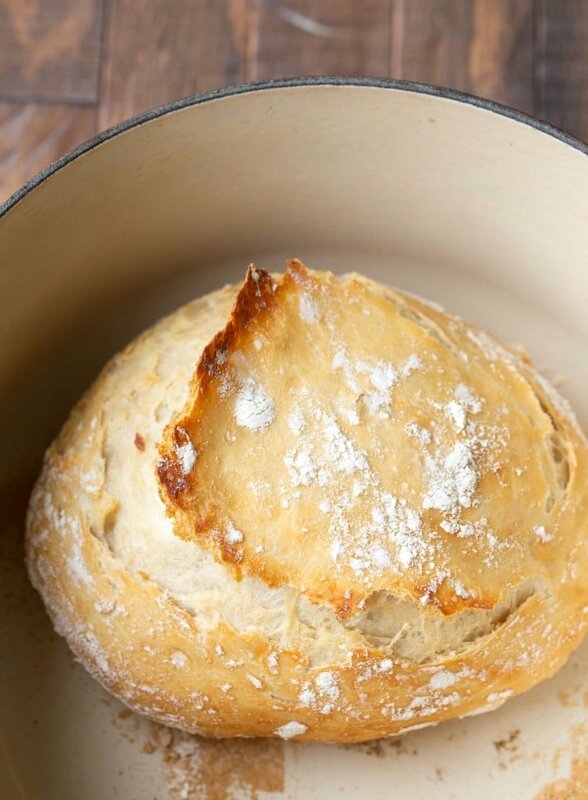 Easy, No-Knead Bread recipe is the simplest way to make beautiful loaves of artisan bread in a Dutch oven. 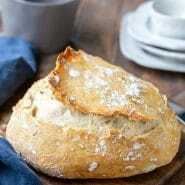 Includes links to no-knead bread variations. Published 3/14/12. Updated with new pictures and tips 10/4/18. Oh my holy cow! 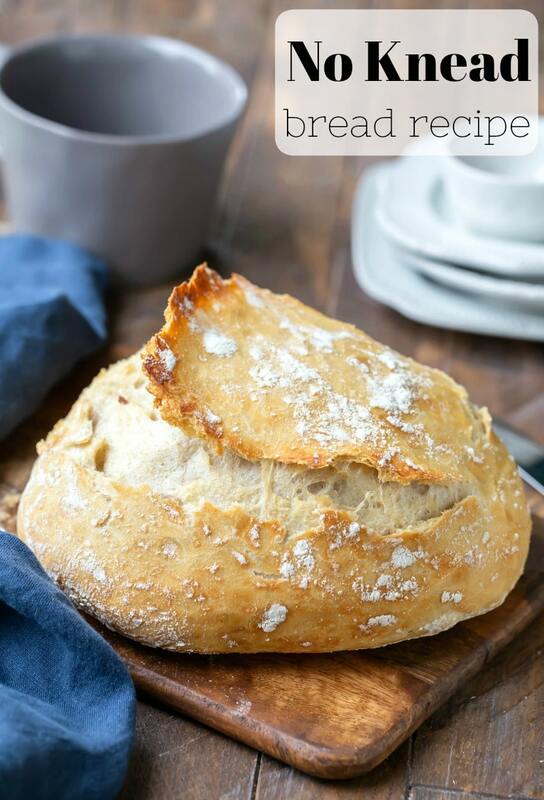 This no-knead bread is a-mazing! I don’t want to over exaggerate how fantastic this bread is, but it’s pretty much life-changing. Not only does it look like expensive, artisan bread, but it also tastes fantastic. I made a couple loaves of this bread and took it to dinner at our friends’ house the other day. Everyone commented on the appearance (“It looks like the bread I’d get at a fancy restaurant”) and the taste (“This is amazing! I have to get the recipe!”). Also, this bread couldn’t be any easier to make; I mean, I had the recipe memorized after the first time I made it. Seriously, making the bread this way is easier than making bread in a bread machine (and that’s saying something). Simply stir the flour, salt, and yeast together. Add the water, and stir to combine. Cover, and let it rise for about 12-18 hours. That’s it! Just be sure to put the mixture into a container that’s large enough to hold the dough as it rises and expands. Can I let the dough rise longer? You can. I’ve let the dough rise for 36 hours before baking it. It just gets a little tangier as it sits. If you have a silicone baking mat, that works really well as a moveable surface for letting the dough rise. I’ve made this bread in both a Dutch oven and in Corningware. If you use something other than a Dutch oven, just make sure that it’s oven safe for the temperature. I included directions for making the bread softer or crustier. We like it with a chewy, slightly crusty crust, so I use the plastic bag method with our bread. If you like a harder, crustier crust, just skip the bag and let it cool on the rack. 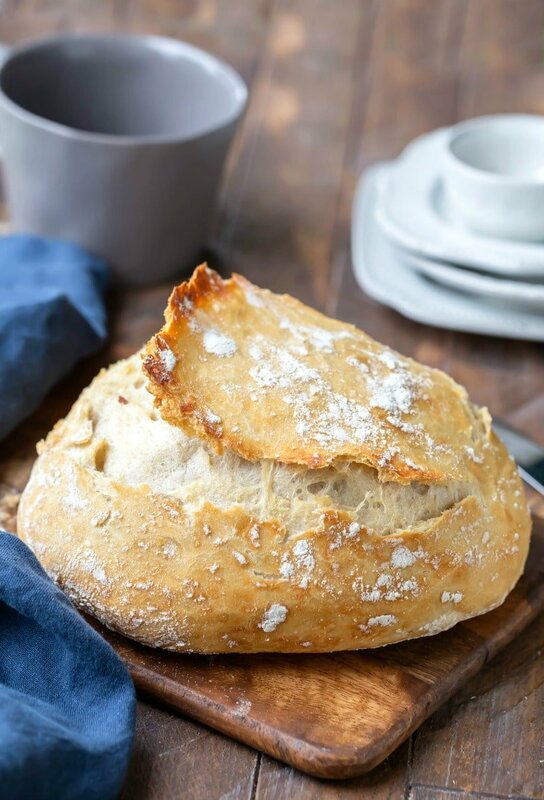 If you’ve tried this no-knead bread recipe, don’t forget to rate the recipe and leave me a comment below. I love to hear from people who’ve made my recipes! You can SUBSCRIBE to receive my latest recipe newsletters or FOLLOW ME on FACEBOOK, INSTAGRAM and PINTEREST for even more delicious food. In a large mixing bowl, whisk together flour, salt, and yeast. Cover bowl with greased plastic wrap and set aside for 12 - 18 hours. Making it the night before works really well. When the oven has reached 450 F, place a Dutch oven or Corningware in the oven and heat the pot for 30 minutes. Meanwhile, pour dough onto a very heavily floured, movable surface (cheesecloth, cutting board). With floured hands, shape dough into a ball. Cover with greased plastic wrap and let it sit while the pot is heating. Remove hot pot from the oven, drop in the dough, and cover. If you're using Corningware, simply cover with foil. For a crispier loaf, uncover, and continue baking for 5-10 additional minutes. Remove bread from oven and place on a cooling rack to cool. For softer bread, let bread cool for 5 minutes on a rack. Then, place in a plastic bag but do not seal. For crustier bread, let cool to room temperature on rack. Do you use a standing mixer for the whisking of the bread? Lastly, I’m assuming you mean to take the bread out of the pot after baking & let cool directly on the rack? Sorry but I’ve never made bread before. No need to apologize! I’m happy to answer questions. =) I don’t. I just mix it by hand. I start off by whisking it, and then I switch to a spatula to finish mixing in the flour. The dough will be shaggy and drier than a normal bread dough. As it sits, though, it will become a wet dough. I spritz the plastic wrap with a little nonstick cooking spray. Yes, you will take it out of the pot and let it cool on the cooling rack. If you have any other questions, please feel free to ask! 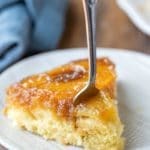 This is a wonderful recipe! I’ve made it for years. Thanks for sharing! I don’t have a cast iron pot–is there another that would work? I have a Rachel Ray Casseround, and other glass and metal baking dishes (casserole dishes, bread loaf pans, etc). What would you suggest I use? Yes, you can use something else. I’ve used my Corningware baking dishes and covered them tightly with aluminum foil. I think just about anything would work as long as it will withstand the high temperatures. If I wanted to split it into two loaves in regular dark non-stick bread pans, do you know how much I would have to cut down on the baking time? Especially for the part before you take off the lid/cover? Have you done that yet? This bread looks so comforting and the picture is gorgeous. 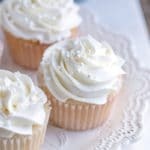 Saw this on FoodGawker and had to stop by! I do not have a pan of any kind that is oven proof or has a lid can I use a pizza stone? I also don’t have plastic wrap can I just put a towel over the mix while it’s rising? Would this recipe work with a pampered chef deep dish baker?? Maybe? I’m not familiar with that baker, but I’ve made this bread in a dutch oven and in a Corningware baker with aluminum foil covering it. So, I would guess that it would work (as long as it can withstand the heat), but I’m not 100% sure. I had never used yeast before this recipe (and I’m 42 yrs old!). Incredibly easy! Fun to make with different beers instead of the water. My favorite variation, however, was a gift from a friend…she added 1/4 cup sunflower seeds. Wow! 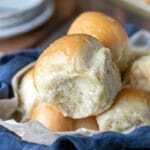 Did you use active dry yeast or instant yeast for this recipe? I’m assuming instant, since you didn’t have to let it proof in warm liquid before mixing in the dry ingredients. I think I’ve actually used both depending on what I have on hand. However, you’re right – instant yeast does work well since there isn’t a proofing step. If you have any other questions, please feel free to ask! I have no cast-iron pot. Would a roasting pan with lid work? The lid needs to be tight-fitting. If the roaster pan lid is, then it should be ok. If not, you could use aluminum foil. I’ve used it in a pinch, and it works just fine. I hope that helps!